I love pickles! Preferably these zesty dill ones. I discovered a few year back that restaurants were taking these normally sandwich side items and frying them making them even more irresistible. Snookie and I were really happy about this news. If I could eat anything I wanted, then I would down these guys anytime I was craving them, but I can’t because I am like the majority folks with a normal metabolism. So, if I cant eat these guys fried, then lets bake them. Turn oven broiler on high. In a medium bowl, whisk together eggs and flour. Add Worcestershire sauce, hot sauce, garlic powder, and pepper. Mix well. Place panko bread crumbs in a dish. 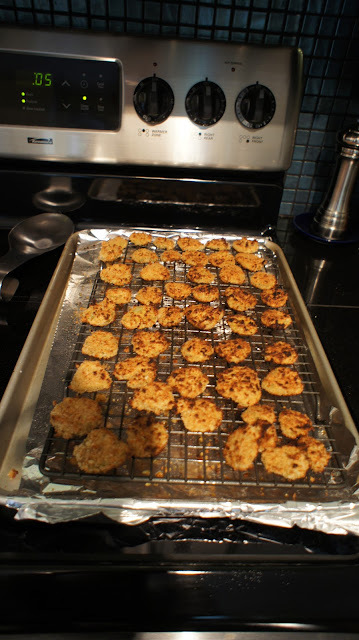 Dunk each pickle slice into the egg mixture, fish out with a fork than dredge it in the panko bread crumbs. Spray rack with non-stick cooking spray and place coated pickles on a rack set above a baking sheet. Make sure to place the pan in the middle rack of the oven. Broil for about 3 minutes on each side. Keep an eye on them. The broiler is your friend and your foe. I made a side sauce by mixing equal parts mayo (actually Miracle Whip), ketchup, and little squirt of spicy grain mustard. Yummy! I ended up using the remainder of the mixture to make baked chicken strips. I use chicken tenderloins and baked them in the oven instead of using the broiler. The “fried” pickles and the chicken tenderloins felt like a cheat meal but without all the guilt.